OpenGov was at the Responsible Business Forum for Sustainable Development (RBF) held on 23 and 24 November 2016 in Singapore and attended a few workshops based on the UN’s 17 sustainable development goals (SDGs) to be achieved by the year 2030. SDG 11 – Sustainable Cities and Communities commits to implementing policies and practices, to ensure cities are safe, clean and sustainable. This includes improving access to affordable, quality and safe housing, improving road transport, expanding public transport, and investing in green public spaces. Particular attention must be paid to improving urban air quality, waste management and insulation against the impact of natural disasters. Ms. Sorkin began with the question of what businesses and governments can do to work together to scale sustainable solutions and ensure that cities are more resilient and inclusive. Ms. An from CDL responded by saying that there is a very high level of government involvement in Singapore and the 3P (Public-Private-People) partnership model is very unique and working very well in Singapore. 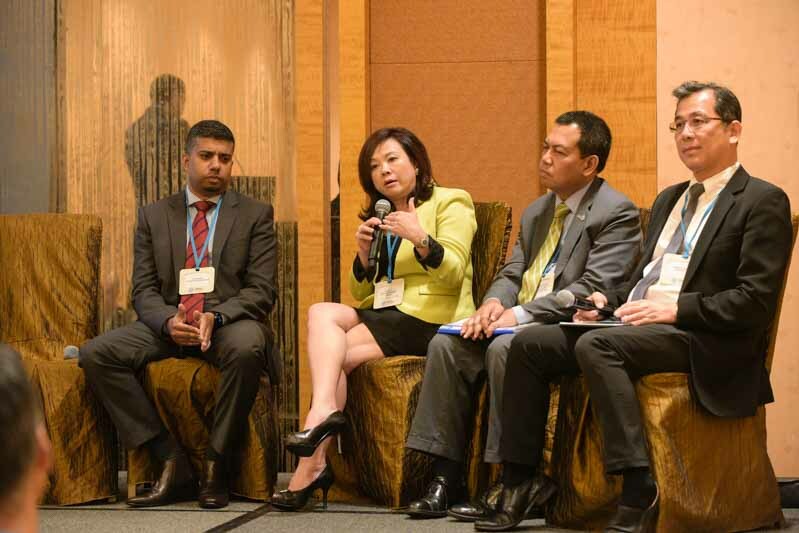 The example of the Building & Construction Authority (BCA)’s ambitious target of achieving 80% green buildings in Singapore by 2030 was cited- currently it is at about 30% and there will be lots of collaboration needed between the public and private sectors to achieve the set target in the next 14 years. Ms. An explained that CDL works closely with the government to achieve and go beyond the basic level under the Green Mark Scheme for buildings, a leading green building rating system in the tropics and sub-tropics, which serves as a benchmark for evaluating environmental sustainability in buildings launched in 2005. In addition, the government has in recent years also incorporated the consideration of sustainable land and building use/practices for developers who are bidding for land for development – it is not just about who has the highest bid. Turning to Dr. Tantikom, Ms. Sorkin asked him about what role the built environment can play in making cities greener, more inclusive and accessible. Dr. Tantikom’s reply was that the (Bangkok) city government has to play an important role in that and it begins with proper planning. In the case of Bangkok, the challenge is that the current city plans are outdated and new/future plans also revolve around the existing city space. Due to the densely-packed nature of the city, the amount of green space per capita in Bangkok is only 4.5 sq metre, which is much lower than the UN standard of 9 sq metre – the previous city governor wanted to expand that number but it still remains a big challenge to do so. In recent years, Ms. Sorkin mentioned that the amounts of data generated by cities have grew exponentially and it presents an opportunity to organise that data in order to plan cities better. She then asked Mr. Naicker of Huawei about the role technology can play in more resilient and inclusive cities that are prepared for disasters if they occur. Mr. Naicker said that very often, many government agencies have collected their own data sets but are reluctant to make it easily available and share them across other agencies. His work includes working closely with local government authorities and agencies about how to get the data right, how to extract data and mostly importantly, look at how to interface the different digital layers and manage data properly across different networks. Ms. Sorkin then asked Datuk Ibrahim about what is it that governments need from business in order to make cities more accessible and build local communities. Datuk Ibrahim replied that fundamentally, business and government communities are very different in terms of vision and very unlikely to meet each other. However, building communities will require some level of convergence between business and government, to identify and work on projects that will be able to improve the capacity of the community not to only improve living comfort but also enhance their economic standing. When the project was first started to develop the Iskandar region, the involvement of the community was a top priority and 14 projects were identified in which the communities were given the necessary tools and knowledge so that they would be able to transit from their existing livelihoods to new types of economic activities. Due to development, these communities were not able to carry out the economic activities that they used to do, for instance, fishermen due to the development that was happening at the waterfront. With the same skills, they transited towards eco-tourism related jobs and drew more income collectively than they used to as individual fishermen. Read about our coverage of SDG 9 – Industry, Innovation and Infrastructure here and SDG 17 – Partnerships for the Goals here.